The company, which operated during its first six years as Bergen and Niland, had its headquarters in Meriden, CT. 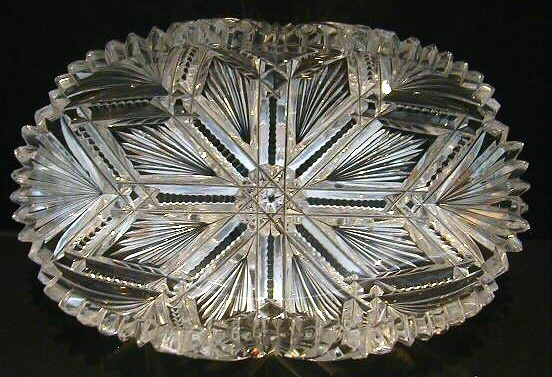 It is said that James D. Bergen learned the cut-glass business in New York City and Brooklyn and at the Mt. Washington and New England Glass Companies. 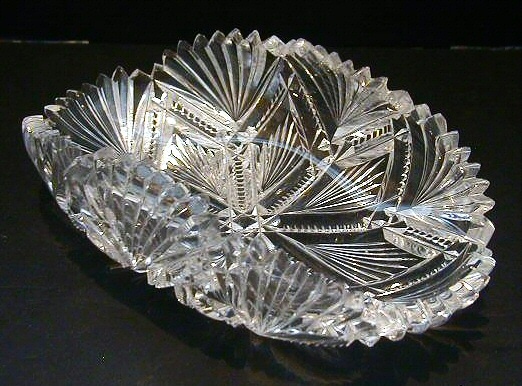 His company was sold to William B. Bartley about 1913, and Bergen died in 1919, after being associated with the Bergen Cut Glass Company of St. Louis, MO for a few years. The complete Bergen trademark is shown on the right. A simplified version was sometimes acid-etched on the company’s glassware, but an illustration of it is not available at the present time. The two hemispheres acknowledge operation of a Bergen factory in Stourbridge, England in addition to three in the United States: Meriden, CT and Brooklyn and Port Jarvis, NY. An acid-etched script signature, Bergen, has also been reported. Three views of a spoon tray, shape 720, cut in Bergen’s patented “Elegance” pattern of 1895. L = 7″ (17.8 cm), w = 4.25″ (10.7 cm), h = 2.1 cm (5.4 cm). Damage includes “five teeth with small chips and one tooth that is partly missing”. Sold at an eBay auction for $57 in 2007. [1893 Catalog] THE J. D. BERGEN CO., MANUFACTURERS OF RICH CUT GLASSWARE. 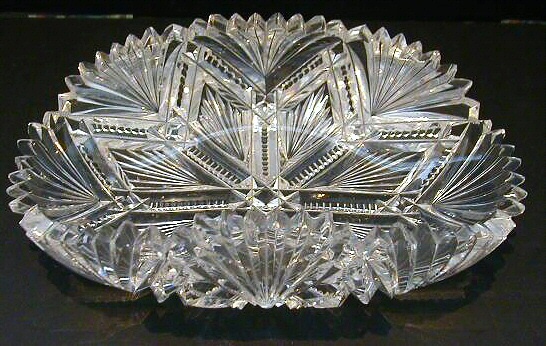 American Cut Glass Association, 1999 (viii + 80 pp.). [1904 Bergen – Bosworth Catalog] THE J. D. BERGEN CO., MANUFACTURERS OF RICH CUT GLASSWARE (title repeated from 1893 catalog). An excerpt taken from the third salesman’s catalog produced by the F. L. Bosworth Company, Minneapolis, MN. American Cut Glass Association, 2002 (xvi + 80 pp. ).